Amazon highlights, in one of its latest commercials, that it offers low prices and free shipping on millions of items. 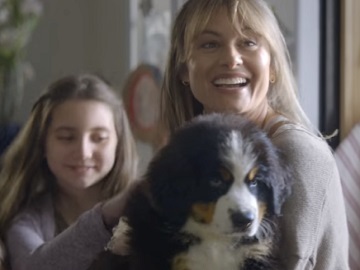 One of the spots, dubbed “Welcome, Pet Owners,” tells the story of a family that adopts a Bernese Mountain Dog. If, initially, the father is a little bit reluctant to the idea of having a pet, it turns out he ends up falling for the cute, furry animal. The man is seen taking him out for walks and slowly embracing the fact that the dog has become a family member. Finally, he is seen petting him at bedtime, which makes his wife look at him proudly. Throughout the video, the dog’s owners are seen ordering on Amazon various pet products, including a large dog bed and food, while onscreen lines highlight that “Amazon is for puppy supplies, Amazon is for free shipping, Amazon is for man’s best friend”. “Amazon’s got everything you need and free shipping for all,” the voiceover says at the end of the commercial, adding the tagline “Welcome, everyone”. The soundtrack music is Freddie Scott’s 1968 song “(You) Got What I Need,” included on the “Celeste & Jesse Forever (Original Motion Picture Soundtrack)” album.